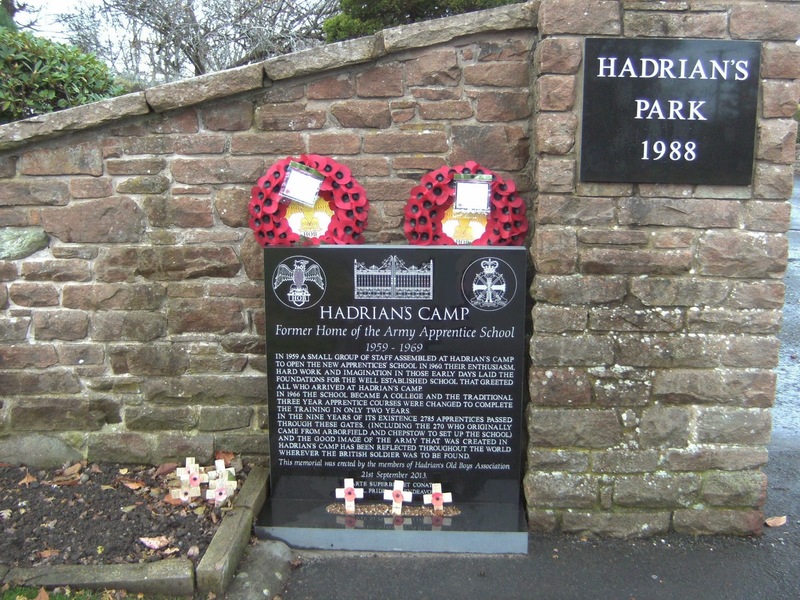 At 11.15 a.m. on Saturday 21 September 2013 a new memorial was unveiled at the main entrance to the former Hadrian's Army Camp at Carlisle, Cumbria. This is the memorial commemorates the period between 1959 to 1969 when the camp was an Army Apprentice School. The memorial includes a pictorial representation of the camp gates that were in place during the time it was occupied by the Army. After the departure of the last Army Apprentices to be trained at this camp, most of the buildings were demolished and many of the fittings sold off. For most of the 1970s and 1980s the majority of the site lay vacant. In 1988 part of the site began to be developed as a traveller's site (mainly Romany travellers). The traveller's site opened in June 1989. Another part of the former army camp is used for police training. Some of the former family homes adjacent to the site were sold off and are still in use. In 2013 a plan came before the council for part of the site to be developed for residential use. Pre-war establishment of Hadrian's Camp. Hadrian's Army Camp was originally established as a militia training depot just before the outbreak of WW2. centre as a militia depot. Carlisle is situated on the line of the former Roman Wall named after the Emperor Hadrian. As the camp was situated on the line of the Roman Wall, it was also given the name 'Hadrian'. The new Hadrian's Army Camp opened on 1 July 1939. Its original purpose was as a training centre. It took a little over three months to develop the camp. By then, Britain and France were at war with Germany. Within the camp there were a full range of buildings: accommodation huts, cook-houses, baths, gymnasium, and assembly hall. It even had its own temporary church building. In total, there were about 120 buildings on the camp and accommodated more than 3,000 servicemen. Hadrian's Army Camp during the war was a Royal Armoured Militia Depot for the Royal Artillery. Effectively, there were two main parts to the camp, plus some housing. One part of the main camp, known as 'Gillman', was occupied by the 13th Anti-Aircraft (A.A.). The second part of the main camp, 'Wardrop', was occupied by 23rd Searchlight. After the war the camp was initially used for servicemen doing National Service with the Royal Armoured Corps. With National Service being wound down in the late 1950s, it was at this stage that it was taken over by Army Apprentices (1959 - 1969). 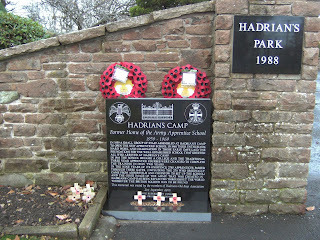 The Hadrian's Camp memorial was erected by the Hadrian's Old Boys Association. Its members were among the former apprentices at Hadrian's Camp. 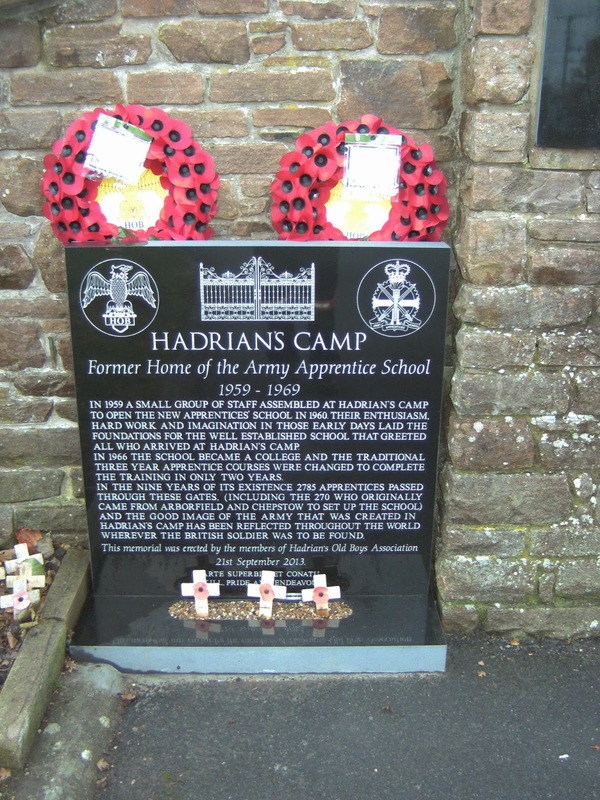 In 1959 a small group of staff assembled at Hadrian's Camp to open the new Apprentices' School in 1960. Their enthusiasm, hard work and imagination in those early days laid the foundations for the well established school that greeted all who arrived at Hadrian's Camp. In 1966 the school became a college and the three year apprentice courses were changed to complete the training in only two years. In the nine years of its existence 2785 apprentices passed through these gates (including the 270 who originally came from Arborfield and Chepstow to set up the school) and the good image of the Army that was created in Hadrian's Camp has been reflected throughout the world wherever the British soldier was to be found. This memorial was erected by the members of Hadrian's Old Boys Association. With skill, pride and endeavour." "With skill, pride and endeavour". The new motto, in both Latin and English, is written at the base of the memorial outside Hadrian's Camp. And win with them the victor’s crown of gold." From: "For All the Saints"
I did my National Service at Hadrians camp from1956 to 1958, as an 11th Hussar. Two of the happiest years of mhy life. I was an Army apprentice at Hadrians from 1961 to 1964, i was 15 when i joined, it was a tough live for a young lad but it stood me in good stead for the rest of my life, I'm still using the skills i learnt there now.